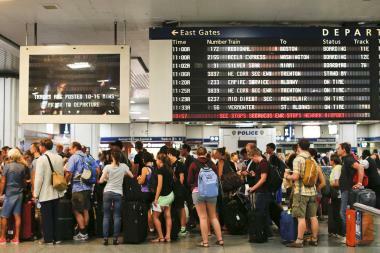 Travelers wait for their trains at Penn Station in 2013. MANHATTAN — As Penn Station commuters brace for what Gov. Andrew Cuomo called the “summer of hell,” Manhattan businesses and their workers are figuring out whether they need to make contingency plans when tracks close for long overdue repairs, experts say. After an uptick in service disruptions — including two derailments — Amtrak will be taking four tracks out of service from July 10 through Sept. 1 for maintenance work, officials announced this week. It will affect service on several of Amtrak’s lines, including cutting 3 trains a day from Washington D.C., as well as slashing New Jersey Transit, which plans to divert trains on its Morris & Essex lines to Hoboken, according to reports, where riders will then be forced onto the PATH train or ferries. And many LIRR riders are expecting to be diverted from Penn Station to Atlantic Terminal or to Hunters Point or Jamaica, though the agency has not announced its plans. NJ Transit and the LIRR are the nation's busiest commuter rails, with each carrying more than 300,000 passengers on a typical weekday. Since the Penn Station track closures were announced, the co-working company Servcorp saw a 4 percent increase in rates inquiring about its space at the now transit-rich World Trade Center, said the company’s COO Marcus Moufarrige. “When something goes wrong at Penn station people need to have alternatives to where they’re going to work or how they’ll get to work,” he said, noting a trend in “flexible” workspaces like theirs, which provide seamless experience with phones from office to office and provide those working from home with a remote receptionist as well as access to board rooms. Firms need to consider scenarios like, “What do I do if half my team can’t get to the office because transportation is broken? How do I mitigate the risk?” Moufarrige noted. Fernandez, a Long Island resident who takes the LIRR to his Midtown office, plans to telecommute more this summer. Fernandez has long been critical that the governor has been focusing more on putting a “mall” into Moynihan Station — the overhaul of the Farley Post Office for Amtrak’s eventual new home — instead of fixing the tracks. He also believes the mess at Penn Station should put more pressure on the governor to finish the East Side Access project — the MTA’s long-delayed and over-budget effort to bring LIRR service to Grand Central Terminal. That $10.2 billion project, slated to wrap up in December 2022, is 13 years behind schedule and expected to come in at double its initial projected cost, according to the Village Voice. “You can alleviate 20 to 30 percent of traffic into Penn Station by connecting to Grand Central,” Fernandez said of the project that has been plagued by fights between Amtrak and the MTA over issues like access and maintenance. He was also critical of New Jersey Governor Chris Christie for killing the Hudson River rail tunnel in 2010. Though that project would have been nearly finished by now and may have potentially helped alleviate some of the current problems, Christie is now pleading the federal government maintain funding for the $24 billion Gateway project to double the rail capacity between New Jersey and New York and replace the aging tunnel infrastructure.